Posted on 29, January 2019 by EuropaWire PR Editors | This entry was posted in Commodities, Energy, Gas & Oil, France, United Kingdom and tagged CNOOC PETROLEUM EUROPE LIMITED, Culzean gas field, exploration, gas field, Glendronach discovery, Glengorm discovery, Kevin McLachlan, Licence P2215, Maersk Oil, oil, oil reservoir. Bookmark the permalink. PARIS, 29-Jan-2019 — /EuropaWire/ — Total has announced a new significant discovery on the Glengorm prospect located in the Central Graben, which is part of the P2215 license. The license was previously part of the Maersk Oil portfolio, in water depth of about 80 meters, close to existing infrastructures operated by Total and offering tie-back possibilities, such as the Elgin-Franklin platform and the Culzean project, scheduled to start production this year. It also presents some upside potential with several other prospects already identified on the same block. The new discovery follows Glendronach, which was announced in September 2018. Initial estimates are in the range of 250 million barrels of oil equivalent. 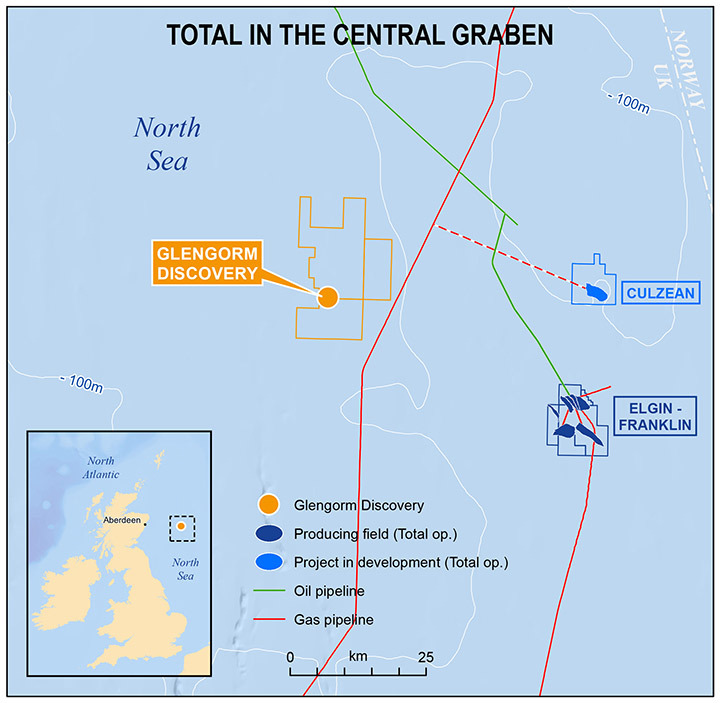 Total holds a 25% working interest in the Glengorm discovery. Other partners include CNOOC Petroleum Europe Limited, a wholly-owned subsidiary of CNOOC Limited (50%, operator) and Euroil, a wholly-owned subsidiary of Edison E&P SpA (25%). Total is one of the United Kingdom’s leading oil and gas operators with equity production of 179,000 boe/d in 2018 working in the country for more than 50 years. Total’s production in the United Kingdom comes principally from operated fields located offshore in three major zones, the Alwyn/Dunbar area in the Northern North Sea, the Elgin/Franklin area in the Central North Sea and the Laggan-Tormore hub in the West of Shetland area where the Glendronach discovery was made last year, and from recently acquired Maersk Oil assets.